Casting is the most important method of commercial jewelry production. Even for small workshops, lost-wax casting is often the fastest method for creating a jewelry piece, especially if there is any complexity to it. However, one of the things that jewelers forget when carving wax models for lost-wax casting is just how different wax is from metal. They often use techniques and tools designed for working with metal for carving wax, even when it does not make sense to do so. By approaching wax as wax, not metal, jewelers can come up with new and faster ways of creating wax models for casting. Besides the obvious burs and engraving tools you have lying around your bench, there are a number of common items that can be used on wax. Because wax is softer than metal, you can use poor quality tools on it with positive results. Try your local dollar store for files, hobby carving tools, and scraping tools. Needle files, hand files, and rasps that would wear out quickly on metal retain their cutting edges perfectly when kept just for wax carving. A pipe cleaning or scraping tool can be used for boring out large holes in wax, as can large reamers used for sheet metal work. 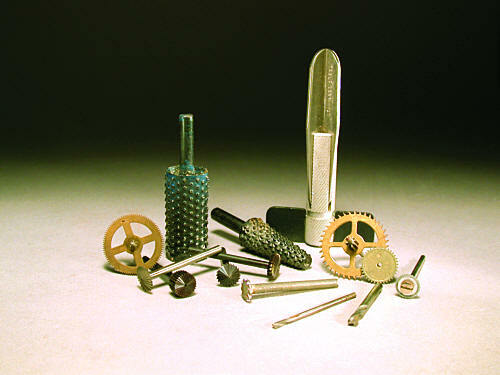 One of my favorite sources for wax burs is old gears, such as those found in old alarm clocks. Even gears made of brass are suitable for cutting wax. Fortunately, clock gears are often mounted on rods, which means they are ready-made for use as burs in your flex-shaft handpiece; you don’t even have to buy a screw mandrel to mount them. If necessary, you can sharpen the gear teeth in the direction of rotation with a file or a separating disc. If you don’t have an old alarm clock handy and you need a wax bur right away, grab a nail. By cutting into it with a separating disc, you can turn a nail head into a handy wax bur. Don’t throw away your broken burs! An old tapered bur or rod makes a great wax-drilling tool that won’t gum up. Just grind or file half of it away (see diagram). Fine burs used for metal will often gum up when used on wax, so cruder tools with large teeth are preferable for wax carving. Cheap sets of coarse burs used for wood carving are great for wax work. Check your local hobby store for wood carving tools of all kinds. Dremel modeling tools are some of my favorites. They have a number of excellent coarse cutting bits. When used in a flex-shaft handpiece, screws carve wax well. Drill bits also work if you use the spiral flutes as cutting edges. I like to use drill bits to carve flat-bottom holes in wax for cabochon stone settings. Grind the end of a drill bit flat. If held at 90 degrees to the wax surface, it cuts only sideways. Tilt it and it sinks. Hold it vertically and it will not cut deeper, only sideways. It’s perfect for cutting a channel or a flat-bottom hole for a wax bezel. To cut a bezel, start by laying out the shape of the stone. Then use the drill bit to carve the flat-bottom hole. Finally, carve the wax block from the outside towards the hole until you have the bezel shape.